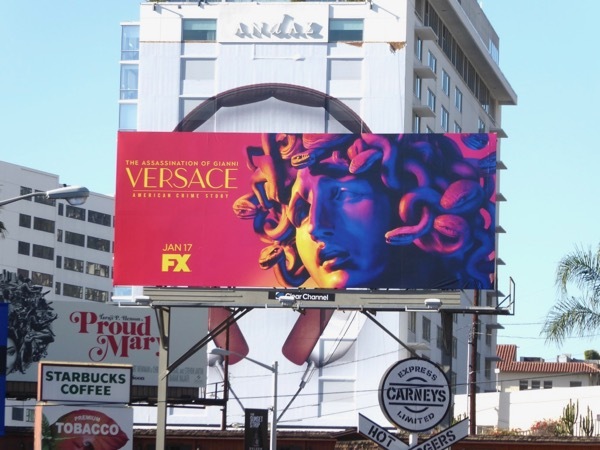 Back in February 2016 Ryan Murphy and Brad Falchuk took their anthology series premise from the successful American Horror Story and applied it to true crime, with the result being the critically acclaimed American Crime Story: The People v. O.J. Simpson. 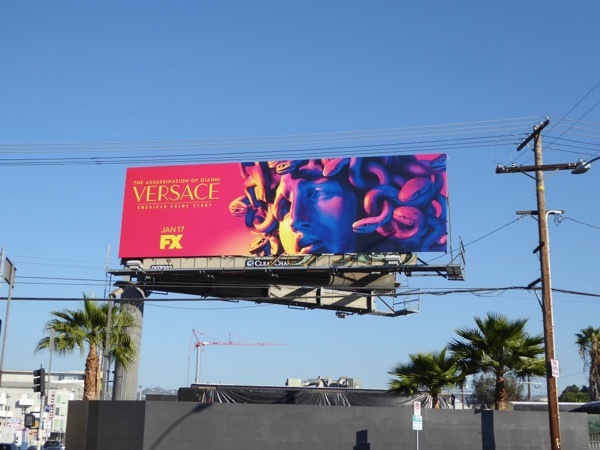 The second season of FX's self-contained mini-series format was initially going to be about Hurricane Katrina, but that got swapped for The Assassination of Gianni Versace. 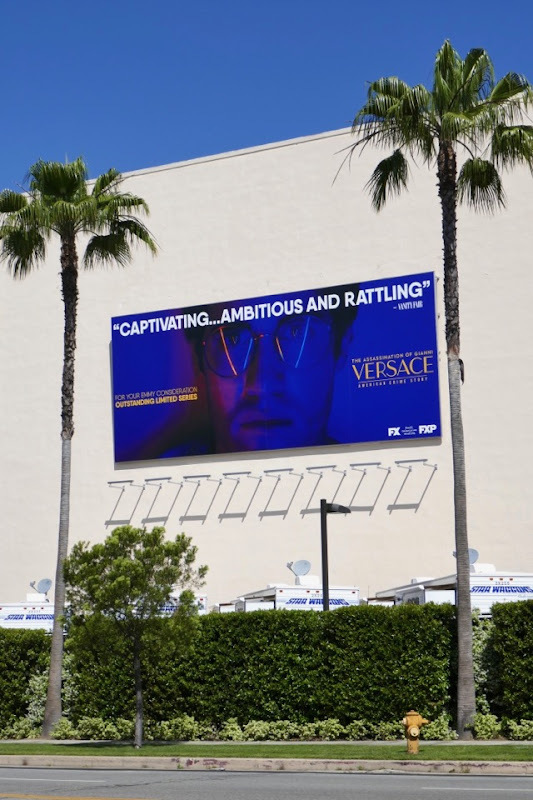 Based on Maureen Orth's 1999 book, Vulgar Favors: Andrew Cunanan, Gianni Versace, and the Largest Failed Manhunt in U.S. History, this installment is about the murder of the iconic fashion designer Gianni Versace (played by Édgar Ramírez) at his Miami Beach home in 1997 at the age of 50 by serial killer Andrew Cunanan (Darren Criss). 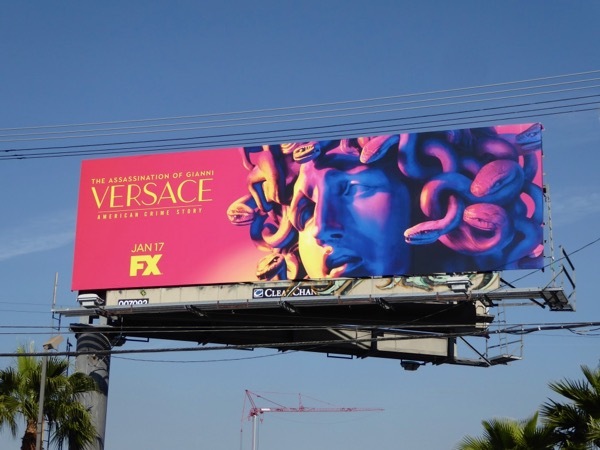 The all-star cast will also feature Penélope Cruz as Versace's younger sister Donatella and Ricky Martin will play his boyfriend, Antonio D'Amico. 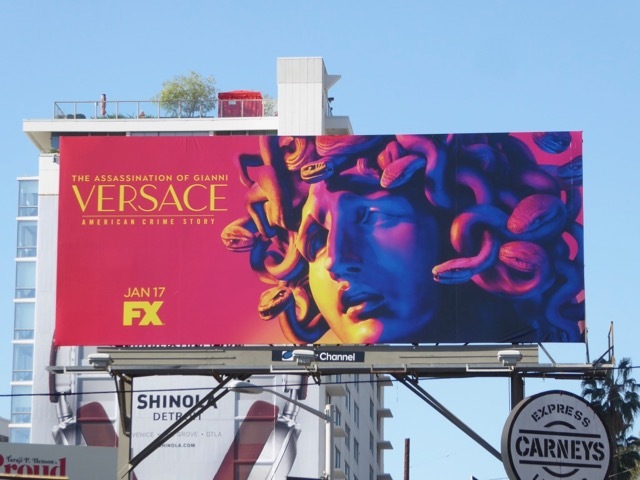 These striking series launch billboards featuring a medusa head, the fashion brand's logo and similar to those that adorned Versace's opulent Miami Beach palace, were spotted above West Hollywood's Sunset Strip on December 27, 2017, plus later along La Brea Avenue on January 5, 2018. For more true crime, make sure you also check out these American Crime Story: The People v. O.J. Simpson billboards. 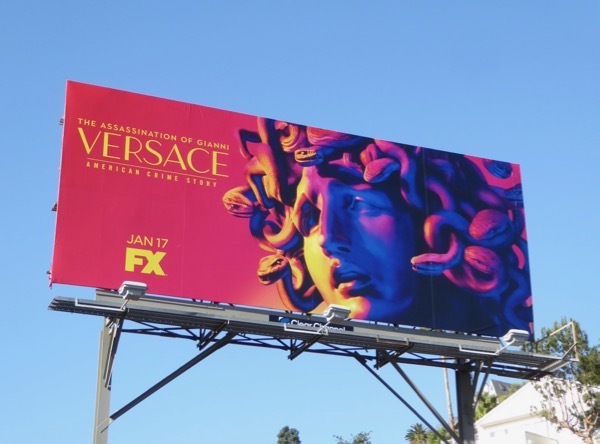 Plus for more snake-inspired ad creatives, you can also enjoy this Alexander McQueen fashion billboard and this American Horror Story: Coven billboard. The People v. O.J. 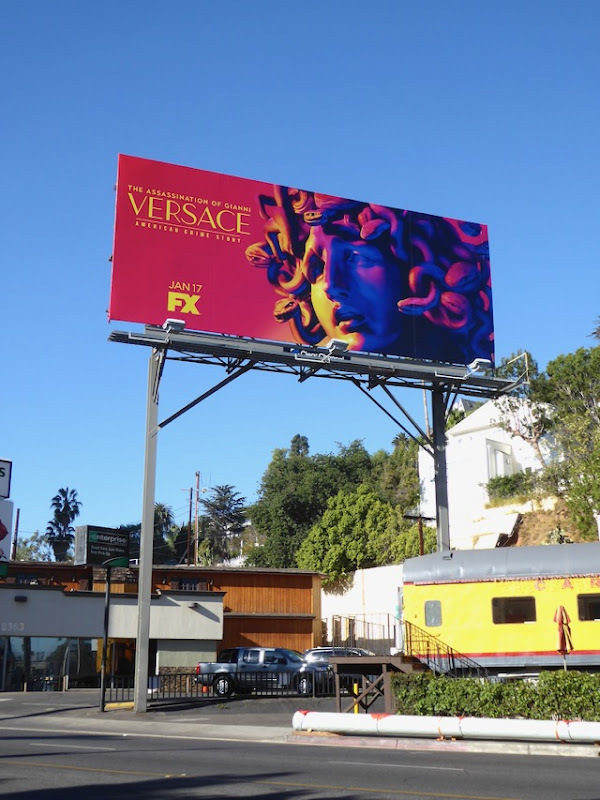 Simpson took home nine Emmys and two Golden Globes, so let's see if this new drama can captivate audiences as much as the glamorous designer's clothes captured the imagination of celebrities and fashionistas alike. UPDATED: Can this sophomore season of American Crime Story enjoy the same awards recognition of the first? 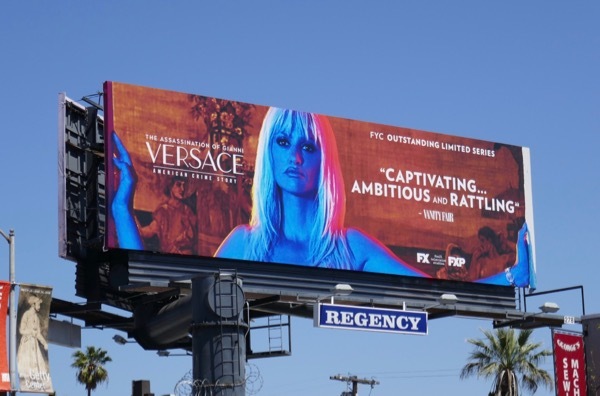 Maybe this Emmy consideration billboard, snapped along Pico Boulevard on April 25, 2018, and featuring Penélope Cruz as Donatella Versace will help garner some TV Academy votes. 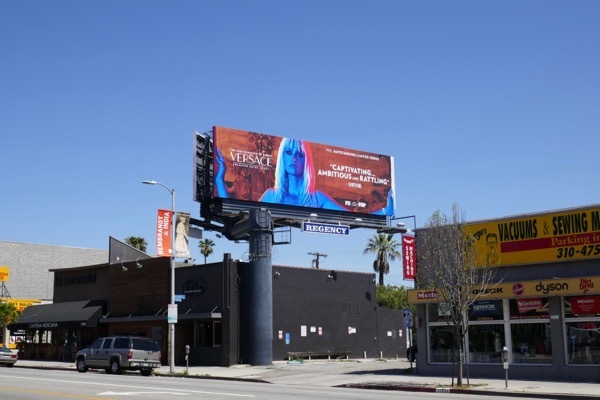 UPDATED: Here's another captivating Emmy consideration billboard for the limited series snapped at L.A.'s Fox Studios along Pico Boulevard. 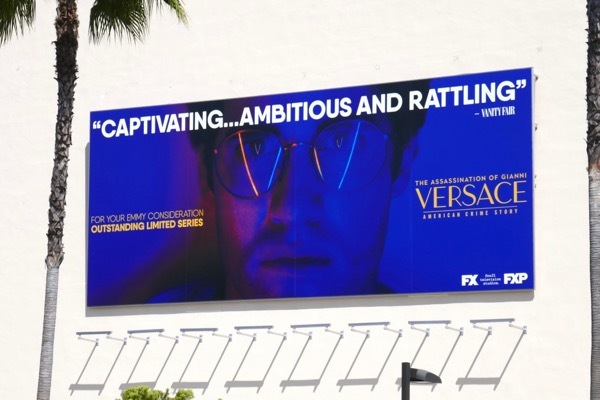 This atmospheric ad creative features Darren Criss as the disturbed murderer Andrew Cunanan. 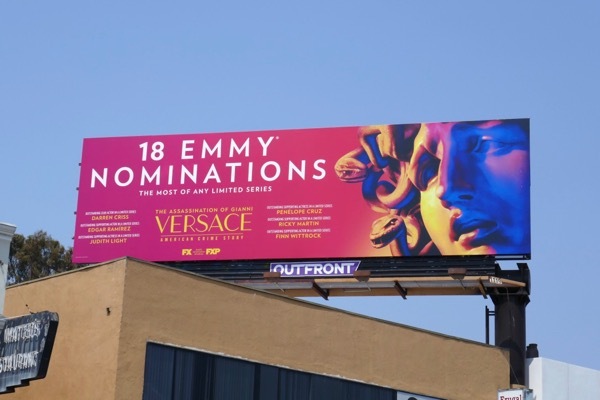 UPDATED: Here's another Emmy consideration billboard for the limited series spotted along the Sunset Strip on June 7, 2018. 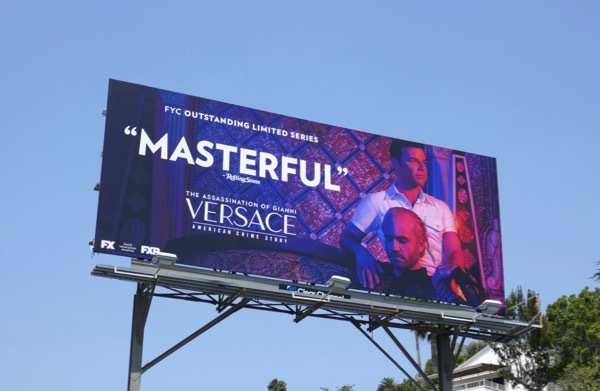 This 'Masterful' version features Édgar Ramírez as the fashion designer and Ricky Martin as his lover Antonio. 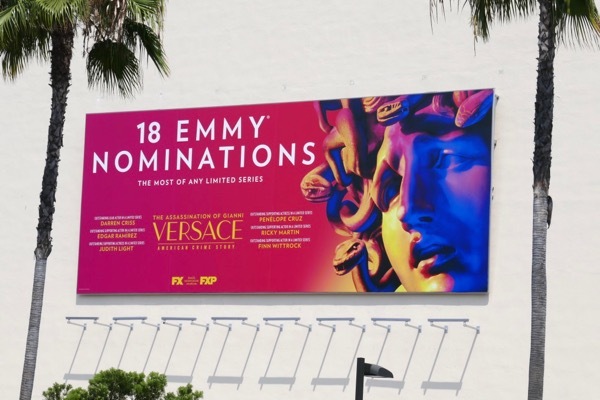 UPDATED: Congratulations to The Assassination of Gianni Versace for garnering eighteen Emmy nominations. 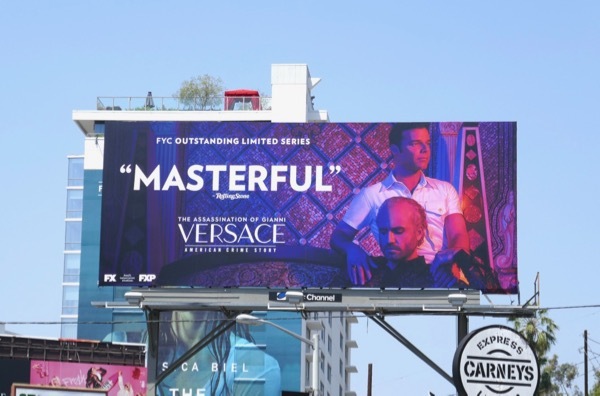 Not only did the show score an Outstanding Limited Series nomination, but also impressive nods for Darren Criss as Outstanding Lead Actor, Édgar Ramírez, Ricky Martin and Finn Wittrock as Supporting Actors and Penélope Cruz and Judith Light as Supporting Actresses. 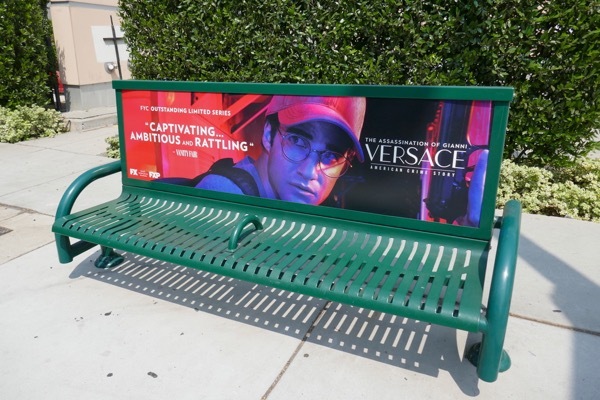 These Emmy nominations billboards and bench ads were spotted along Pico Boulevard and Westwood Boulevard on July 28, 2018.